Meherwan Sheriar Irani (Meher Baba) was born in Pune, India in February 1894. His parents were of Persian origin. He was first educated in Dastur Girls’ School and later in St. Vincent High School, from where he was matriculated. In 1913, while in his first year at Deccan College he came in contact with Hazrat Babajan, one of the five Perfect Masters of the Age, who by a kiss on his forehead awakened him to the experience of what one may call God-realization. Meher Baba began his unique silence on 10th July 1925, and stopped writing in 1927. At first he communicated by writing on slates, then by pointing to letters on an alphabet board, which he gave up on 7th October 1954. Thereafter he conversed through his own unique shorthand system of representative gestures. 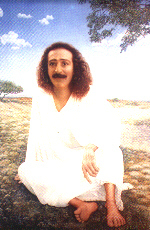 Though silent and abstaining from writing, Meher Baba had released a large volume of works revealing the spiritual theme of human life clearer than any master had ever done before him, explaining creation, evolution of consciousness through infinite variety of forms, re-incarnation and involution of consciousness in a language intelligible to an average man’s understanding and at the same time scientific and logical in convincing the rationalist. The history of man’s search for his soul has produced few works dealing with the technique for the soul’s discovery. Meher Baba’s discourses are a major contribution to that small body of literature. In this work, given to his close disciples in the period 1938–43, he describes the means of incorporating daily life into one’s spiritual ongoing. He also outlines the structure of Creation, but only to clarify the relationship of the aspirant to the Master. In his classic later work ‘God Speaks’ Meher Baba described in detail the vertical system of God, His Will to know Himself consciously, and the purpose of creation in the Will . The discourses on the other hand are the practical guide for the aspirant as he slowly finds his way back to Oneness, after having developed consciousness through the deeps of evolution. While the discourse provide detailed descriptions of the Path and its disciplines. Rather, they are a constant, firm reminder of the need for a Master on this Path of apparent return to Oneness. The Master is the knowing guide who had already traversed the Path, who provides with infinite patience the secure and steady pace that can lead to the goal. While Baba admits the possibility of achieving progress without such a guide, he makes it clear that it is fraught with almost insurmountable problems, and difficulties. To one who debates allying himself with a teacher of the inner processes, the discourses provide invaluable insight. To one who senses that life is to be lived for its positive contribution to the discovery of the inner being, Baba provides the unarguable description of one who knows. His other books, ‘Listen, Humanity,’ ‘ Life At Its Best’, ‘Beams on the Spiritual Panorama’, ‘The Everything & The Nothing’ were given by him to educate the minds of earnest aspirants after Truth, giving them enough intellectual insight to understand the falsity of this material world and ego-centric and separative existence, and to awaken love for Truth (God) and longing for living in Truth (God).